As the newbie at The Confident Stitch, I was excited for the opportunity to pick some fabric and select a pattern to make up! I’m pleased to share my experience with you all. If you’ve been into the shop or visited our online store, you can imagine what a struggle it was to select a project. I wanted to start with five. 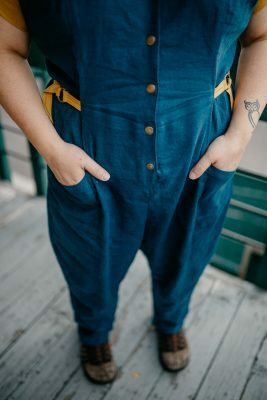 I did, however, manage to whittle my way down to the Yari Jumpsuit pattern by True Bias (because who doesn’t love a jumpsuit, am I right?). For fabric, I was intent on the Roma Stretch Linen in Teal with a bit of the same fabric in Mustard to accent the sleeve bands and the side ties. The color was intoxicating, and it caught my eye as I considered which to choose time and time again. I’m a pretty experienced “seamster,” and the True Bias pattern rates the difficulty at 2 ½ out of 5. There are multiple versions available in the pattern envelope. All include the V neckline, a button-front closure, and some expertly designed princess lines that start at the shoulder and travel all the way down to the hem of the garment. Options include shorts or ankle length pants, sleeveless or extended sleeves with a band (read: extended cap sleeve), side ties or no side ties. The pattern has gloriously deep pockets, but these could be eliminated if so desired. One thing I appreciated about the pockets is that they can pack a lot, yet they never take away from the longer line of the jumpsuit. Sometimes tight-fitting garments can technically accommodate my cellphone, wallet, and keys, but I end up with bulging pockets that outline their contents. I could be squirreling away acorns with the pockets in the Yari and others would be none the wiser. That’s a feature I really enjoy. Having chosen the extended sleeve version, I didn’t mind one bit when the sleeve was a simple continuation of the body side/shoulder seam rather than a set-in sleeve. I LOVED that the sleeve band eliminated the need for a hem – replacing it with a simple rectangle stitched short end to short end, then folded in half and attached to the perfectly matched sleeve opening of the jumpsuit. I chose the longer pant so I could have a more versatile piece to add to my wardrobe. 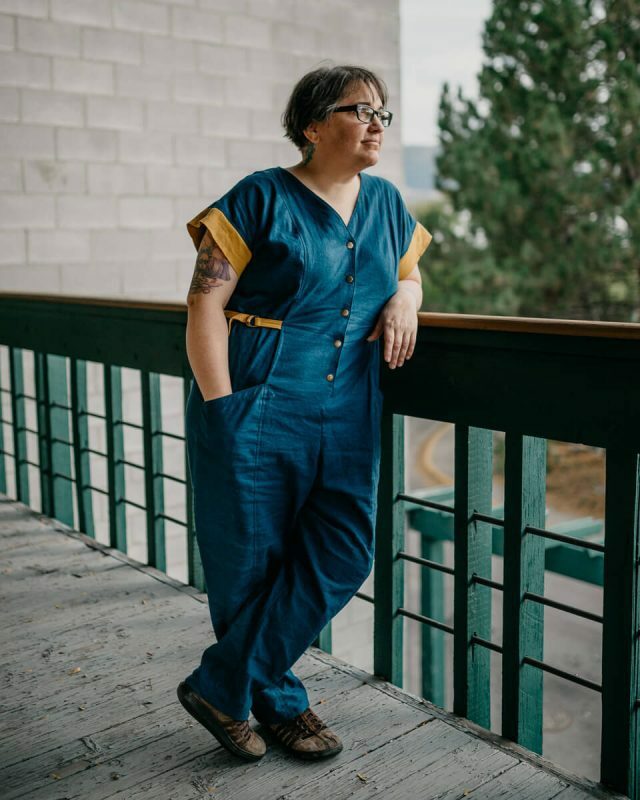 I get hot very easily, so the Roma Linen was perfect on the warmer days, yet the longer pant allows me to transition into fall easily on days when it’s cooler and I want more coverage. I thought the side ties would flatter my figure best, plus they’re a good excuse to add another pop of color and balance out the mustard I chose for my sleeve band. Being experienced doesn’t mean I don’t make some Sewing 101 mistakes. It happens! In choosing which size to cut out, I used some old measurements rather than taking current ones. Oops! I also neglected to pin the paper pattern and try it on before I cut. (Some Swedish Tracing Paper would have made a try-on so much easier and saved me some fabric!). I got lucky and ended up with something bigger than needed rather than something too small. It’s not the worst mistake since, as I say way too often, you can always cut off extra fabric, but you can’t grow it. I will say the Yari Jumpsuit did give me a few hints that I was working with something a bit big for my body. Fortunately, the Yari was also super easy to tweak after the fact. The princess lines and side seams allow for almost any alteration you may need to make for the perfect fit. I do recommend checking the length and the bust circumference before cutting your fabric. If you have a larger bust (DD+) the Yari will still look fantastic on you, it just requires a bust adjustment. The length may be too short for anyone above 5’ 6” or who wants a pant hitting below the ankle. I did diverge from the written instructions in just a couple of sections. If you’re feeling great about the fit of your Yari from the get-go and have done any preliminary adjustments to the pattern, the directions will not lead you astray! If you are like me and suspect additional fitting may be necessary, try stitching the princess lines together (holding off on the clipping and topstitching), stitching the inner leg portion and pinning the side seams/shoulder seams. Working the Yari in that order will allow you climb into it and adjust any seamlines as needed without requiring you to rip out any topstitching. Pinning the side seams also makes it easier to go back in and topstitch those princess seams without fighting a mostly-made garment. In addition to switching up the order of the main seamlines, I also opted for set in snaps rather than buttons for my center front closure. It wouldn’t be terribly difficult to adjust for a zipper closure either. As for the side ties, I disregarded the sewing instructions (shhhh – don’t tell!) and stitched them up in my own way. This may have contributed to my straps being too long. I’m not 100% sure what I did there. Regardless, I didn’t have any issues shortening either the straight tie end or the D-ring tie end until the sides could be cinched down in such a way that they looked as I imagined they should. I’d also recommend double checking the crotch depth. I ended up making a swayback adjustment on the center back pieces to make my Yari less baggy in the crotch and more nipped in at the waistline. Fabric choices! As I mentioned, I chose the Roma Stretch Linen for my Yari, and I’m very glad I did! The stretch and the fiber content make this fabric incredibly soft and comfortable to wear. I think it looks respectable and tailored enough for a semi-casual work environment, but it’s secretly as comfy as pajamas. The Roma in Teal did have some dye escape in the room-temperature prewash water of my tub; however, you’d never know by looking at the finished product. The color remained as vibrant and gorgeous as it was on the roll. The Roma is amazing after a prewash and a little tumble in the dryer. It brings out a great texture in the fabric and basically eliminates those deep creases that can happen with a super crisp linen. The Roma is exceedingly wearable. As we move into the cooler weather, I could easily picture the Yari in a heavier-weight woven or knit fabric by making minimal adjustments to the side seams. The sleeveless long-pant view could be paired with an undershirt for a warmer winter option. 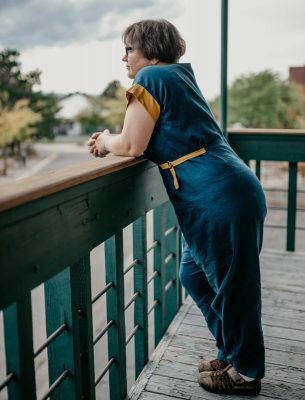 I hope my experience in making up the Yari Jumpsuit is helpful and encourages you to give this adorable romper a try! The only thing I enjoyed more than stitching it up is wearing it out and about. It’s a unique, versatile piece I anticipate wearing for many years to come! This entry was posted in Pants, Pattern Reviews and tagged true bias, Yari. 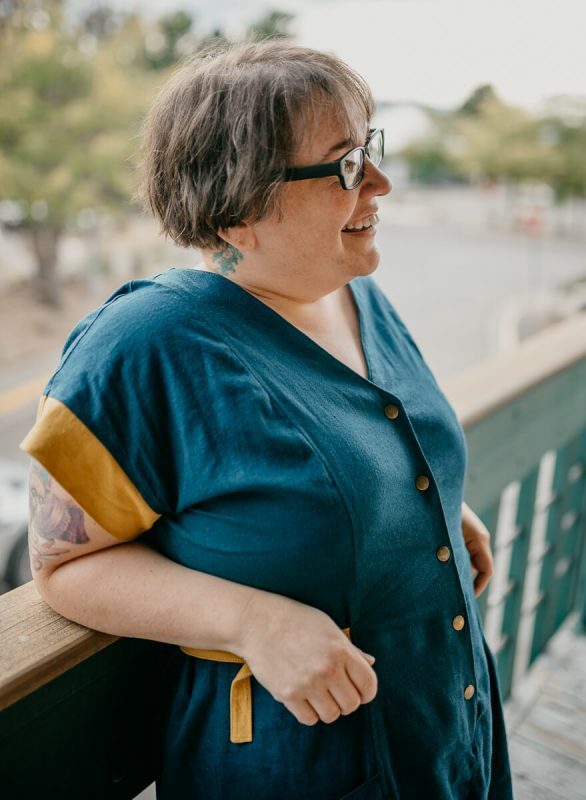 Jen Grady grew up in Southern California making up her own sewing patterns and hand stitching them out of repurposed sheets. 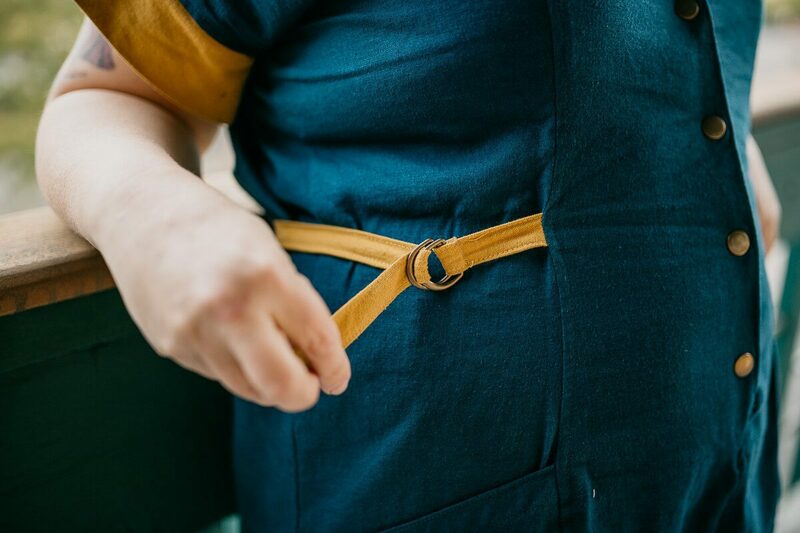 Eventually her interest in sewing evolved into a desire to create clothing options for body types not typically catered to in ready-to-wear garments. She is always excited to help customers realize their sewing goals with tips and tricks along the way!